“Obama Aiding and Abetting” Terrorism. The setting free the Top 5 Terrorists from GITMO is likely to come back to bite the United States. Tags: aiding, abetting, terroris,. 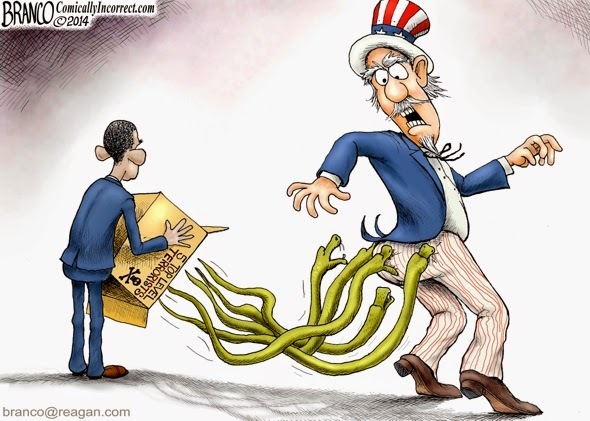 releasing, top 5 terrorists, Gitmo, will bite U.S.,editorial cartoon, AF Branco To share or post to your site, click on "Post Link". Please mention / link to the ARRA News Service. and "Like" Facebook Page - Thanks!